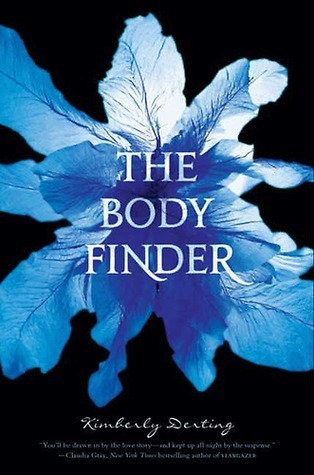 The Body Finder is a book that has been on my radar for a while, but I was always a little worried about reading it. The book description was unique and I was worried it would fall flat and I’d be left feeling a little let down. The Body Finder does none of this. It is just as good as the description sounds. Both aspects of the novel, the suspense and the romance, are developed well and blend together. It never felt like one was taking a hit so the other could flourish. This was a page turner. The serial killer parts of the novel were fantastic. There’s a lot of mystery there, and it’s done well. It gives the entire book a creepy feel. I was afraid to look over my shoulder; it felt like the creepiness had oozed of the novel and was standing right behind me. I love it when a book can make me feel that way. The relationship between Jay and Violet was wonderful. This is the kind of “insta-love” I’m okay with. It’s insta-love in the scope of the novel, but not in the characters’ lives. Sure, Jay and Violet realized their feels early on in the novel, but they had a foundation of friendship to build upon and that’s what made it work. Their relationship works perfectly to balance out the serial killer roaming around town. The other secondary characters, Violet’s friends, are also well-written. They aren’t placeholders; they actually act and behave like friends. Maybe it’s just the novels I pick to read, but this trait seems to be a little lacking in a lot of Young Adult titles today. The Body Finder is a fantastic novel. It has just the right mix of creep and love to keep me turning the pages, anxious to find out who the killer is, but to also read more swoon-worthy moments. This is a series I’ll definitely be sticking with. I can’t wait to read more. This entry was posted in Mystery, Thriller, and Suspence, Something a Little Different, The Must Reads, Young (and New) Adult and tagged Kimberly Derting, Must-Reads, Mystery/Thriller, Paranormal, Suspense, Young Adult.